As I’ve already said, this is their two piece ball. I’ve done a video review to accompany this review and now would be a good time to stop, get a drink and watch how I got on. Check the video here (Vice DRIVE Youtube Review). If you made it to the end, a) well done and b) you’ll have a good idea of what I thought but this blog will go into more detail and I’ll give my thoughts on key areas and score each out of ten as well as an overall rating. Before I proceed further, many thanks to Nick Kevern, editor of Golfhacker, a brilliant online magazine (check their website here for the latest magazine and loads more great stuff – Golfhacker Website) for giving me the balls to test. It seems like excellent product placement too with the Golfhacker logo on them, ready for free advertising when I lose them. Whilst this is their two piece offering, it’s not an entry level ball by any stretch of the imagination and bears no resemblance to some of the cheap two piece balls on the market. Vice say this is designed for players with a low to medium club head speed (so perhaps not ideal for someone that swings as fast as I do, although I am working hard to slow it to a blur). It’s a 368 dimple design and has a surlyn cover that Vice say is resistant to scuffing and marking up. I played my home course, Royal Ascot just after a bout of rain, not really enough to make a difference to the fairways which the green staff had worked on after the summer drought but just enough to give the greens a modicum of hold. That said throughout the summer the greens were still relatively receptive to a well struck shot and our greens staff did a brilliant job, on very limited resources to ensure they were some of the best I’ve putted on in 2019 and I’ve played a number of top 100 courses in the UK. So after all this build up, what did I think? Well I didn’t swing the club perfectly after a stressful day in work and a fraught rush to the course. That said, this is fairly representative of where my game was at that time anyway, I was playing a premium four piece in the firm summer conditions and will switch to a three piece, the AD333 tour, once the colder, wetter weather arrives. As I stated in the video, this ball actually surprised me. It performed far better than my pre-conceptions when I did my initial introduction and even when I pegged it up on the first hole I filmed. Let me reiterate, as I feel it’s an important point worth repetition, that what you see on the videos, warts and all, including poor swings and shots, are as it happened. I don’t re-shoot any poor or duffed shots and I test the ball exactly as I find it on the course, whatever the lie or position on the hole. As always, I conclude these reviews breaking the ball and the way it performed into a number of key components and mark each separately out of ten and then give an overall score. Again, this is subjective to how I found they performed and please bear in mind these may not hold true for all standard of golfing standards. 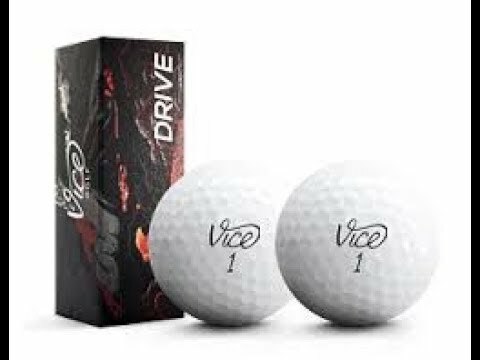 Vice do offer a testing pack, which is a two ball sleeve of each ball in their range and so it may be worth investing in one of these and trying the DRIVE (and all their other balls) to make sure it’s the ball for you. I called the DRIVE as the Vice entry level ball. It’s so not that in any way at all. It’s a ball designed to be both part of their range as a whole and capable of standing on its own merits. It fits both parts of the criteria well. It definitely ticks a lot of boxes, particularly in terms of durability, which may be a buying decision when you look to purchase new golf balls. As far as a two-piece ball goes, this is right up there with any of the market leaders in my opinion. I’ve spoken already about pre-conceptions and I think we all suffer from this whenever we try new gear. Once I get out there and film any review I try and be as open minded as I can and each and every one are an honest and unbiased opinion on what I really thought.